Here’s another protein packed Beast Bowl to fuel the beast in you. 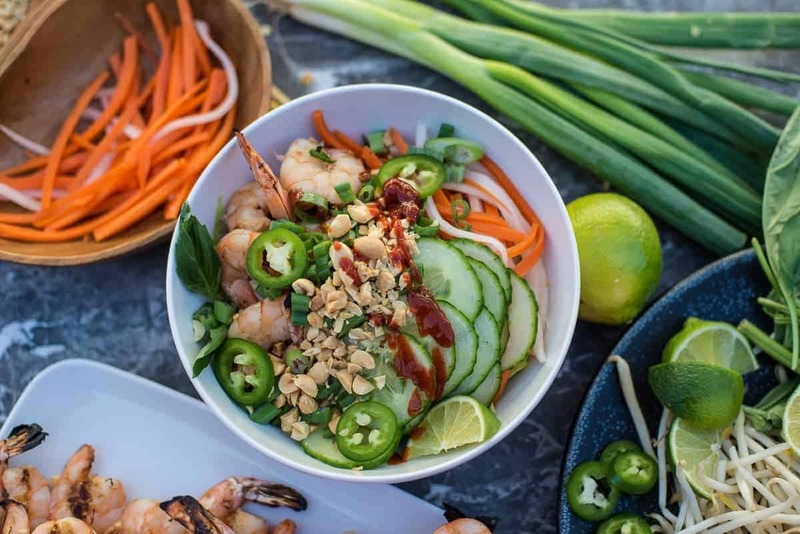 It’s full of fresh lemongrass shrimp, tons of veggies and just enough carbs to keep you flying through your day. In my own personal health and life journey, I struggled with balance for many years. Life’s constantly busy with all the things that have to get done, and all the people that we love in our lives have needs. I often completely forget about what I need. I feel selfish for thinking about me. There is a twang of guilt with I take time to go to the gym and be away from my daughter. Forget about asking for some time to spend alone. I know you can relate. I started this food blog about six months ago because I wanted to share my love of cooking and food. As things have started to evolve I’ve started to really think about what real people, like you, need. I’ve seen one very prevalent need in all of our lives – we need more time to do the things we love. I want to give you that time. I absolutely love being in the kitchen and cooking. I know everyone doesn’t like to spend as much time in the kitchen as I do, but we all want to eat delicious and healthy food. As I keep writing and sharing my love of food with you, I am going to start focusing more on recipes that make your life easier. I want to share with you more of how I free up a lot of time for myself by doing food prep. As an athlete, I want to make sure these recipes are going to fuel your daily jam, whatever that may be. There is so much dietary confusion. So how do you figure out what to eat? I strongly believe in whole foods first. But I also believe that there is no one right diet for everyone. We all need to figure out that is for ourselves. I want you to find balance in your relationship with food. I want you to learn to recognize what disordered eating looks like and figure out how to change it. I want you to learn to accept your body right now and feed it out of love for your self and your own well being. I’m inspired by so many strong and powerful women in my life and I want to share that with you too. If you’ve been on the blog you already know that I eat a lot of things in bowls. It makes putting a balanced meal together really easy and it’s usually prep-able and packable. I will be featuring a lot of bowls that you can prep each week. 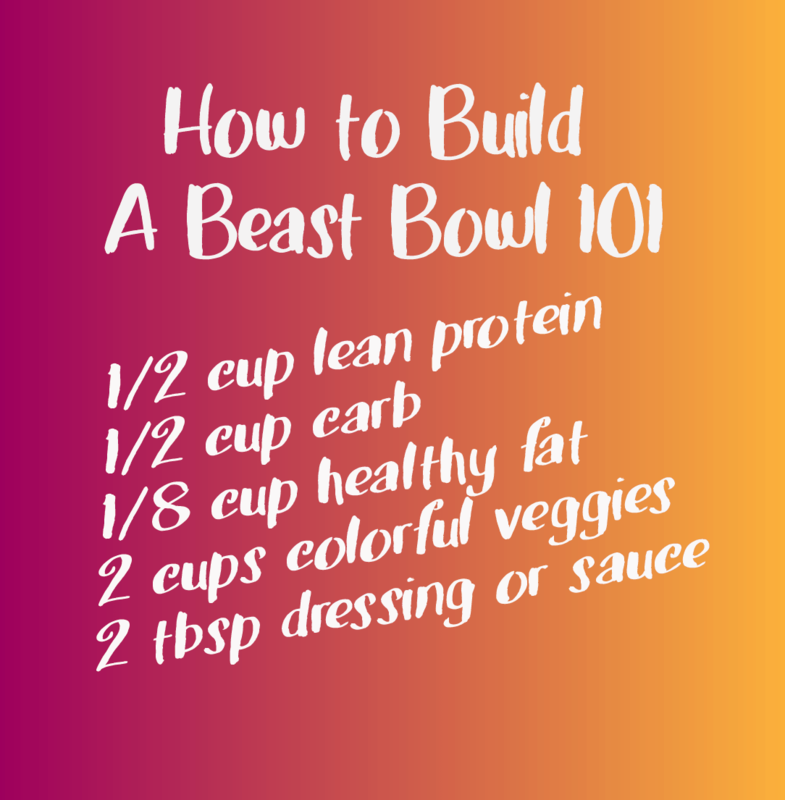 You can build a beast bowl with anything that you can imagine. I use the formula above to pack lunches for the week. 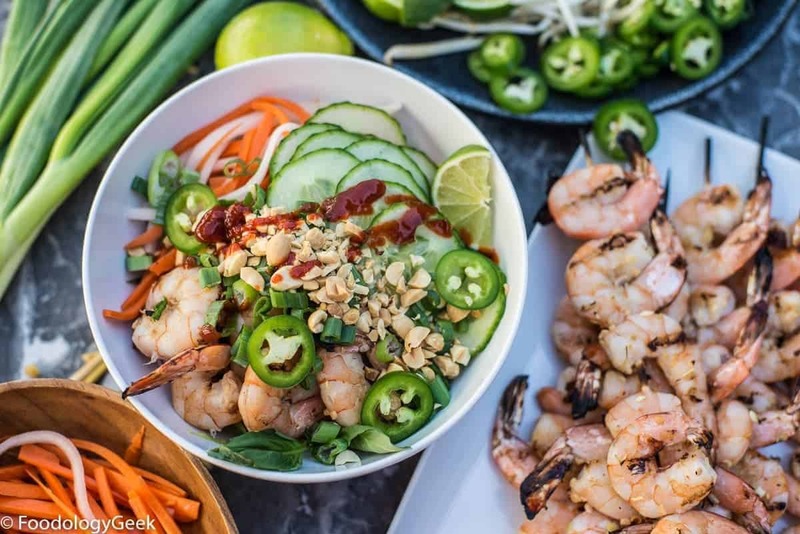 Protein packed lemongrass shrimp, served with a ton of fresh vegetables and a Vietnamese dipping sauce. Marinate the shrimp: Put shrimp in a shallow dish. Add fish sauce, brown sugar, garlic and lemongrass. Mix well to coat. If you are going to grill, place the shrimp on skewers. Shred lettuce leaves and herb sprigs, place at the bottom of each bowl. Keep cool, covered with a damp towel. Put oil in a wok or frying pan over high heat. When oil is hot, add shrimp without crowding (work in batches if necessary). Cook for about 2 minutes per side, until lightly browned. 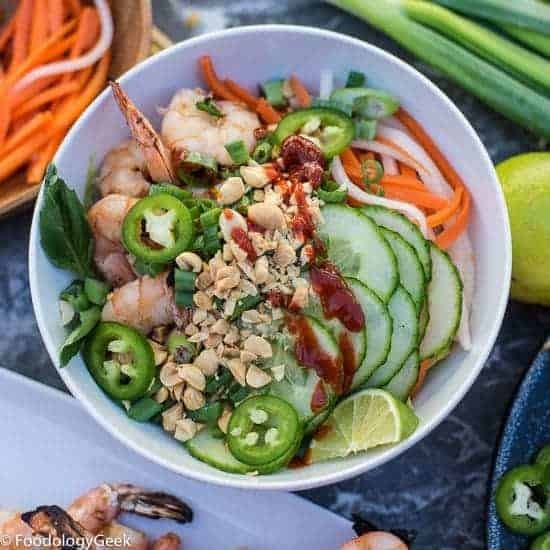 To serve, divide the noodles among the 4 large soup bowls, then top each with hot shrimp, pickled vegetables and a tablespoon or so of dipping sauce. Sprinkle with scallions and peanuts (and beans sprouts if using). Serve with extra herbs, lime and Sriracha. For Vegan Option: Use tofu instead of shrimp. Replace fish sauce with coconut aminos.